Here are the one sided hexominoes arranged into 12 congruent shapes. But there are one or two flaws: The dark blue hexominoes, which are the symmetric ones, may not occur more than once each in a shape. And the other colours, which are in chiral pairs (ie left- and right-handed versions), also may not occur in the same shape. The flaws: Shapes 6 and 8 have two symmetrical hexominoes, shape 1 has two staircases, 5 has a matched pair, shape 8 has a matched pair as well as the two symmetric pieces. And shape 12 has two 'long N' shapes. Your task is a simple one - rearrange these hexominoes to eliminate these flaws. To make your task easier, there's only one solution so you can't stumble on the wrong one by mistake. Also each shape will have only one tiling. That's not a requirement, but you can use that fact to make things easier. These hexominoes are one-sided so you can't flip them. TLDR version: Print these pieces in colour, cut them out, and arrange them, coloured side up, in twelve copies of the given shape with no colour repeated in a shape. The method of solving is the same as for my answer to this similar problem, except that when picking sets of five hexominoes, colours that are already included aren't considered. Not the answer you're looking for? 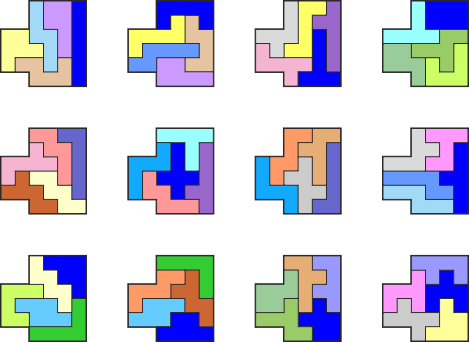 Browse other questions tagged geometry graph-theory tiling polyomino or ask your own question. How many possible different shapes are there on a 4x4 dot grid?